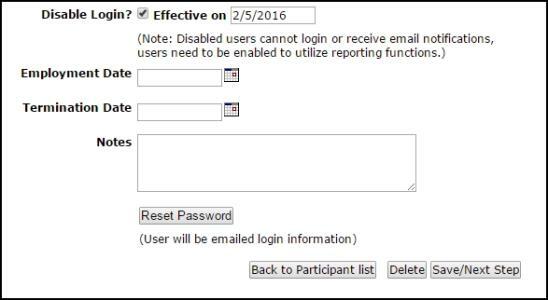 When a user leaves your organization, you will want to disable their login so that they can no longer access the system or receive email notifications. We recommend disabling a user account rather than deleting it to preserve the history of the incidents associated with the user account. Scroll down the Incident Participant Information page to the Disable Login? option. In order to protect your data integrity, we highly suggest disabling the user instead of deleting. Deleting a user may have a negative impact on your reporting by misrepresenting who was responsible for the work as well as removing labor transactions made by that user. If you still need to delete the user, you must remove the user from: all incidents, routing, work queues, and labor transactions. *Note: Disassociating data from a user could be time intensive depending on how much data is tied to that user. Contact our Legendary Support Team to learn more about additional data services options. Reassign Incidents - Before deleting a user, all incidents assigned to that user regardless of status must be reassigned to another user. You can use the Batch Reassign feature to reassign the user's work to another user. *Warning: This will negatively impact your reporting by showing that another user was responsible for this work. Remove from Work Queues - The user must not appear in any work queues. Remove the user from any work queues before deleting.